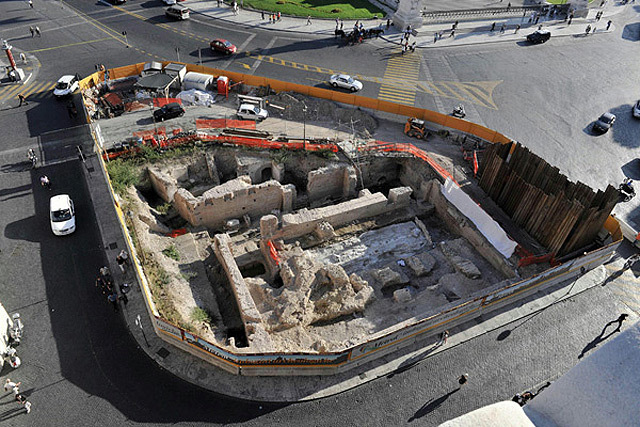 Add another ancient structure to the long list of wonders uncovered during the prepatory excavations for the third subway line in Rome. This time it’s an amphitheater, possibly one built by Hadrian in the second century A.D.
As they dug through down through layers of modern, Renaissance and Medieval remains to the level of ancient Rome, they found what looked like a grand stairway made with sheets of granite and antique yellow marble. Across the way, the remains of a matching stairway — the steps long, shallow and deep — led archaeologists to the conclusion that they were looking at the seats of a covered rectangular amphitheater, a place where plays, speeches and debates were held by the city’s poets, scholars and politicians. 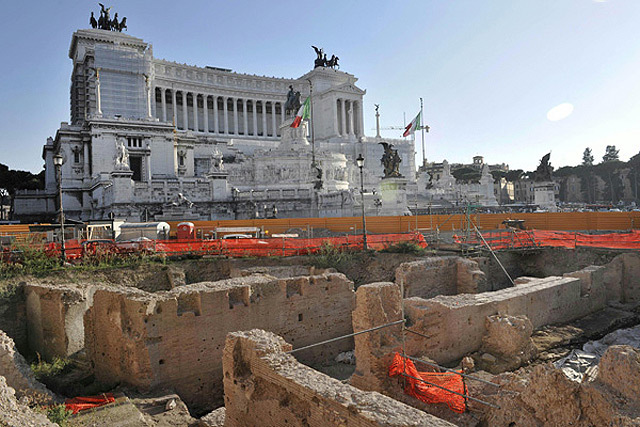 Archaeologist Roberto Egidi, who directed the excavation, said research in texts by ancient sources suggests they have found the Emperor Hadrian’s “Athenaeum” — an auditorium ancient writers say he built at his own expense on his return from Palestine around A.D. 135. The new line, Metro C, will run fully 80 feet underground. It has to because Rome is such a huge pancake stack of history that they’d never be able to get a full subway line built any higher than that. You still have to have stations and air ducts and escalators and whatnot, though, and it’s a major challenge raising periscope through two and a half thousand years of habitation. The amphitheater, in fact, was found in an area of Piazza Venezia that archaeologists thought (or hoped against hope, really) might be relatively “sterile” so a station could be built. Obviously that’s not on now and they’re going to have to build it a few yards away where there are just an ancient sewer system and some ancient shops. Finds that in other cities would be hugely exciting, but in Rome, are the path of least of resistance. 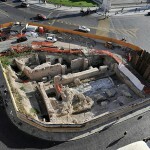 Ancient, medieval and Renaissance structures will be destroyed by this subway. There’s just no way around that. The historic center is so suffocated by traffic a third line is desperately needed. Archaeologists are bummed, of course, but at the same time, this project has given them license to excavate areas they haven’t been able to sink their trowels into before. It has also given them funding, which is very hard to come by in this age of cutbacks. 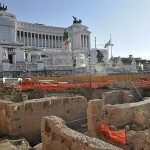 This article has a great video of the Piazza Venezia dig. This entry was posted on Friday, October 23rd, 2009 at 11:27 PM	and is filed under Ancient, Roma, Caput Mundi, Social policy. You can follow any responses to this entry through the RSS 2.0 feed. You can skip to the end and leave a response. Pinging is currently not allowed. Hateful! I’ll see if I can find another video. Rome is such an incredible city! I was there one, about 14 years ago. I was 14 years old. Loved it! I wanna go back, and check out some of these new sites they have found since then.